For many press applications, precise, coordinated motion holds the key to maximizing productivity and minimizing waste and maintenance costs. Whether working on a new press or retrofitting a control system to an old press, success often rides on the capabilities of the motion controller. Here, using a hydraulic press as an example, the controller ensures operational repeatability—achieving tight control of ram speed and force applied. In turn, this necessitates using the right transducers and valves, and a motion controller with closed-loop control and fast cycle time. This two-axis electrohydraulic motion controller, used in the hydraulic-press control upgrade described here, combines processing power with Ethernet communications and a USB monitor port. Successful pressroom performance, in many cases, hinges on the motion controller’s ability to accurately synchronize the motion of multiple axes—critical when the job requires a level platen as multiple compression rams operate, or on presses that form parts between two active hydraulic actuators. An example of this last case is a 100-ton hydraulic press used by a company that makes parts for the aerospace industry. The fabricator upgraded the press with a new control system to fix repeatability and vibration problems. A PLC had been controlling the motion of the press, originally designed primarily for stamping, and the PLC could not precisely control the velocities of the two opposing cylinders. Its insufficient scan rate could not accurately track changes in transducer inputs, and the hydraulic valves lagged in their response to control inputs. To address these issues, the fabricator installed new valves and transducers, and replaced the PLC-based motion controls with a new two-axis electrohydraulic controller, all under the direction of engineering consultant Len Hathaway, of Marine & Industrial Repair Inc., Kent, WA. Hathaway knew that the company needed a controller with millisecond loop times and special capabilities for precise velocity and force control, as well as multiaxis synchronization. 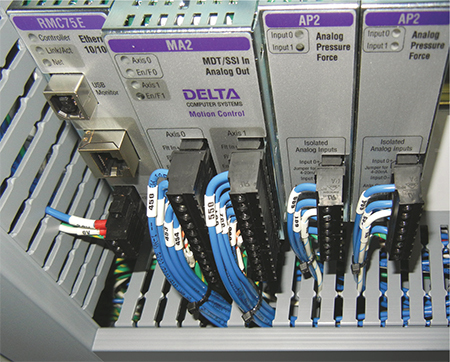 The solution he brought forward: the Delta RMC75E two-axis controller from Delta Computer Systems, Battle Ground, WA. Block diagram of the hydraulic press with opposing cylinders. Describing the operation of the retrofitted press, Hathaway notes that during a compression cycle, the bottom cylinder extends and stops with the bottom form just touching the part. Then, the top cylinder comes down to just above the part, and the part is then heated to allow forming. After heating, the top cylinder moves down so that the top form contacts the workpiece to begin compression. The motion controller precisely controls the velocity of both cylinders, while monitoring the force being applied during compression to ensure that it does not exceed a specific limit. As the top cylinder extends and compression begins, the motion controller causes the bottom cylinder to give way and retract at a controlled rate, ensuring a precision forming process. The accompanying figure shows the block diagram of the upgraded control system. Cylinder-position information relays to the motion controller via a linear magnetostrictive displacement transducer (LMDT) with a synchronous serial interface (SSI) mounted in each cylinder. This transducer gives fast updates, approximately every 100 microseconds. For force feedback, the setup features two pressure transducers mounted in each cylinder, one on each side of the piston. The difference in pressure readings indicates the force applied by the cylinder. At the start of a compression cycle, the motion sequence downloads over Ethernet from a supervisory PLC, which holds the recipes for several different parts. The motion sequence parameters can easily be adjusted for production changeovers using the press’ new HMI. Programming the new controller, developers relied on the RMCTools package from Delta Computer Systems, which features graphical tools for programming and tuning. Rather than using low-level machine code, users of RMCTools can set up motion by filling out forms and selecting intuitive options from pull-down menus. With the motion steps programmed, next came tuning the system for optimal operation. Here, the RMCTools package provides software for analyzing the motion and adjusting control loop gains. A Plot Manager function displays motion parameters versus time, and a Tuning Wizard simplifies the tuning process. Article contributed by Brad Smith, Delta Computer Systems Inc., Battle Ground, WA; www.deltamotion.com.